Draft: 2002, Tampa Bay Devil Rays, 10th rd. Jason Aaron Hammel resides in Chicago, Ill., with his wife, Elissa and children, Beckett and Colby ... Attended Treasure Valley Community College in Ontario, Ore….graduated from South Kitsap High School in Port Orchard, Wash.
Set a career high with 32 starts and 180.1 innings, going 8-13 with a 5.29 ERA ... One of five pitchers age 34 or older who made at least 32 starts, joining: Justin Verlander, Ervin Santana, Ricky Nolasco and teammate Jason Vargas ... His eight wins were his fewest since 2013, when he went 7-8 in 26 appearances (23 starts) with Baltimore ... The Royals scored just 86 runs in his 180.1 innings, a 4.29 run support average, second-lowest in the American League among 23 qualified pitchers ... Went 1-6 with a 6.18 ERA (35 ER in 51.0 IP) and .306 opponents' average (64-for-209) in his first 10 starts through the end of May (Royals went 1-9 in those starts) ... Posted a 4-2 mark with a 3.69 ERA (28 ER in 68.1 IP) and .244 opponents' average (66-for-271) through his next 11 starts in June and July (Royals went 6-5) ... After issuing 23 walks through his first 51.0 innings over 10 starts (4.06 BB/9), he issued just 25 in his last 129.1 innings over 22 starts (1.74 BB/9), the third-lowest walk rate in the Majors from June 1 through the end of the season, trailing only Corey Kluber (1.24) and Jeff Samardzija (1.39) ... Issued one walk or less in nine consecutive starts from July 19-Sept. 1, the longest streak within one season in Royals history ... Walked two hitters or fewer in each of his last 15 starts, the longest streak by a Royals right hander within one season since Zack Greinke (also 15) in 2004 ... Went 5-2 with a 3.96 ERA (23 ER in 52.1 IP) in eight starts vs. American League division winners Boston, Cleveland and Houston…went 3-11 with a 5.84 ERA (83 ER in 128.0 IP) in 24 starts vs. all other teams ... Had a 1-1 record with a 2.66 ERA (7 ER in 23.2 IP) in four Interleague starts ... Posted a 2.53 ERA (9 ER in 32.0 IP) in the first inning, seventh best in the Majors (min. 30 starts) ... Held opponents to a .259 average (119-for-460) through his first 60 pitches, but they hit .325 (90-for-277) after that ... Held opponents to a .226 average (35-for-155) with runners in scoring position, sixth best in the American League… opponents hit just .197 (24-for-122) with RISP in his first 28 starts, but .333 (11-for-33) in his last four ... Retired the first 16 batters on Aug. 26 at Cleveland…after recording the first out in the sixth, he allowed six of the next 10 batters to reach, including three home runs ... Allowed 20 stolen bases in 23 attempts (87.0%)…the number of steals and rate were both second most in the American League. Won a career-high 15 games in 30 starts with the Cubs, five more than his previous career high done four other times (2009, 2010, 2014, 2015)...Made at least 20 starts in each of the last eight seasons (since 2009), one of 15 Major League pitchers to do so…his 220 starts during that stretch are five fewer than new teammate Ian Kennedy...Went 10-2 with a 2.42 ERA (23 ER in 85.2 IP) in 15 starts at home…his home ERA ranked sixth in the Majors and his .191 opponents' average at home ranked fourth...Posted a 6-0 record with a 0.95 ERA (4 ER in 38.0 IP) in his first six starts after the All-Star break, marking the first time in his career he's won six consecutive starts…allowed two-or-fewer runs in seven straight starts from July 7-Aug. 16...Recorded 22.0 consecutive scoreless innings from July 27-Aug. 16, just shy of his career-best streak of 28.1 consecutive scoreless innings from June 1-24, 2010...Issued two-or-fewer walks in 13 straight starts from May 30-Aug. 10, the second-longest streak of his career (14 starts, April 22-July 4, 2014)...45.5 percent of his runs allowed (35 of 77) came in four starts: July 1 at New York Mets (10 runs), Aug. 21 at Colorado (10), Sept. 6 at Milwaukee (nine) and Sept. 24 vs. St. Louis (six)…had a 2.44 ERA (41 ER in 151.1 IP) in his other 26 starts...Posted a 0.75 ERA (2 ER in 24.0 IP) through his first four starts…according to Elias, it is the second-best ERA by a Cubs starter through the first four starts since 1920, trailing only Steve Stone (0.51 ERA in 1976). Jason Hammel went 10-7 with a 3.74 ERA (71 ER/170.2 IP) in a career-high 31 starts for Chicago ... reached a career-high 10 victories for the second-straight season and fourth time overall ... struck out a career-best 172 batters compared to just 40 walks. Averaged 4.3 strikeouts per walk allowed, a career best. Went 5-4 with a 2.86 ERA (33 ER/103.2 IP) in 17 starts prior to the All-Star break ... was 5-3 with a 5.10 ERA (38 ER/67.0 IP) in 14 outings in the second half. Was 7-4 with a 3.49 ERA (33 ER/85.0 IP) in 15 road starts ... went 3-3 with a 3.99 ERA (38 ER/85.2 IP) in 16 starts at Wrigley Field. Recorded a 3.42 ERA (53 ER/139.2 IP) in the second inning and later ... had a 5.23 ERA (18 ER/31.0 IP) in the first inning. Began the season by striking out 27 and issuing just two walks in his first five starts, April 11-May 3. Hit safely in each of his first three starts, including a 2-for-3 game in his first outing of the season, April 11 at Colorado. Allowed five or fewer hits in a career-best eight-straight starts, April 27-June 6. Faced 86 consecutive batters without issuing a walk across four starts prior to walking Aramis Ramirez, May 3 vs. Milwaukee. Finished May with a 2.57 ERA (10 ER/35.0 IP) in five starts, fanning 35 batters and walking just six. Struck out a career-high 11 batters, June 1 in Miami ... allowed one run in 6.2 innings. Became just the fourth Cubs hurler since 1985 to strike out at least 11 and walk none while on the road. Left after 1.0 inning with left hamstring tightness, July 8 vs. St. Louis ... next start was after All-Star break, July 21 in Cincinnati (1 ER/5.0 IP). Recorded his 1,000th career strikeout, August 12 vs. Milwaukee, getting Shane Peterson to start the sixth inning. Allowed seven earned runs in 4.1 innings in two post-season starts. Jason signed with the Cubs in February of 2014 and started 17 games for the Northsiders before being dealt to Oakland along with right-handed pitcher Jeff Samardzija on July 5 for righty Dan Straily, infielder Addison Russell, outfielder Billy McKinney and a cash consideration...In his 17 starts with the Cubs, Jason pitched to a 2.98 ERA (36 ER/108.2 IP) with 104 strikeouts and 23 walks...He tossed quality starts in his first seven appearances and 12 of his 17 starts overall with the Cubs...Was 4-1 with a 2.08 ERA (8 ER/34.2 IP) in five April starts...The four April wins were the most by a Cub since Ryan Dempster and Carlos Zambrano both had four victories in April of 2008...Pitched 7.0-scoreless innings in back-to-back starts, May 31 at Milwaukee and June 6 vs. Miami...Ranked fourth in the National League with a 1.02 WHIP at the time of the trade to Oakland...After being traded to Oakland, he went 2-6 with a 4.26 ERA (32 ER/67.2 IP) in 13 appearances (12 starts)...All told, went 10-11 with a 3.47 ERA (68 ER/176.1 IP) in 30 games pitched in 2014 with the Cubs and Athletics, his second-lowest full season ERA (Baltimore 2012, 3.43 ERA). Jason went 7-8 with a 4.97 ERA (77 ER/139.1 IP) in 26 games (23 starts) with the Baltimore Orioles despite missing over one month with a forearm injury... Began the season 4-1 with a 3.79 ERA (15 ER/35.2 IP) in six April starts … went 3-7 with a 5.38 ERA (62 ER/103.2 IP) the rest of the season... Held right-handed hitters to a .263 batting average (60-for-228) compared to a .300 mark (95-for-317) vs. lefties... Made three relief appearances in September, posting one save with a 1.42 ERA (1 ER/6.1 IP)... Was his first action out of the bullpen since September of 2011 with Colorado... Earned the win in his first start of the season, April 2 at Tampa Bay, tossing 6.0 innings of three-run, three-hit ball... Punched out a season-high eight hitters in 8.0 innings of work, May 27 at Washington... Landed on Baltimore's 15-day D.L., July 29-September 5 with right forearm tenderness... Started two games with Single-A Aberdeen and Double-A Bowie as part of a rehab assignment, posting no record with a 1.35 ERA (1 ER/6.2 IP)... Posted a 3.31 ERA (6 ER/16.1 IP) in five games (two starts) after coming off the D.L. ... walked two and struck out 11... Earned his first save since the 2011 campaign, September 25 vs. Toronto, tossing 2.1 innings of relief while allowing one run on four hits. Tossed at least 170.0 innings for his third straight season...the 170.1 innings this season came in 27 starts for the Rockies...Has87 starts over the last three seasons as a member of the Rockies...The .270 (175-for-658) opponent batting average this season is his career-low, topping the .272 average he allowed in 2008 withTampa Bay...Despite the low average, his .342 OBP and .435 SLG against were both the highest since 2008...With a 7-13 record overall, he set a career-high for losses and his 7 wins were the fewest in his Rockies career...Began the season making 25 consecutive starts before being moved to the bullpen in the middle of August...Hammel wouldfinish the season making two starts in seven appearances over the final month and a half of the 2011 season...Was supported by just 13 runs in the month of May, leading to his 0-4 record in the six starts he made...He lasted at least 6.0innings in all but one of his starts in the month and struck out at least five in three of his six starts in May...Had his best month in September and was arguably one of the Rockies best pitchers in the month when he allowed just five runs,four earned over 20.0 innings and held hitters to a .174 average...Tossed his 14th quality start of the season in his final start, 9/24 at HOU, when he allowed two runs over 7.0 innings in theno-decision...Has 43 quality outings in his 87 starts as a member of the Rockies...Is the only Rockie to have at least 14 quality starts in each of the last three seasons...Tossed at least 6.0 innings in 18 of his 27 starts this season, adding to his career total of 55 outings of at least 6.0 innings in his87 starts in Purple Pinstripes...In his three seasons as a Rockie, Hammel is 21-13 with a 3.26 ERA (367.1 IP, 133 ER) in the 55 outings where he has goneat least 6.0 innings...Went 5-8 with a 4.23 (110.2 IP, 52 ER) in 18 pre-ASG starts...The 18 starts prior to the All-Star break mark a career-high...Earned a save on 9/11 vs. CIN by tossing 4.0 innings and allowing just one run on two hits and striking out four...Was his thirdcareer save and his first since 9/28/08 at DET as a member of Tampa Bay. Followed up his breakout 2009 season by winning 10 games for the second time in his career...went 10-9 with a 4.81 ERA (177.2 ip, 95 er), 47 walks and 141 strikeouts...his 177.2 innings pitched set a newcareer-high, exactly one inning more than his 176.2 innings he had in 2009...also set a new career-highwith his 141 strikeouts...averaged a career-high 7.1 strikeouts per 9.0 innings pitched in 2010...the 18home runs he surrendered in 2010 are also a new career-high, one more than his 17 allowed in 2009...He made four starts in April before being placed on the 15-day DL with a strained right groin...went 0-2,9.16 (18.2 ip, 19 er) in those four starts...the Rockies were 0-4 in his four starts...After being reinstated from the DL, 5/15, Hammel went 10-7, 4.30 (159.0 ip, 76 er) in his 26 starts overthe remainder of the season...his 128 strikeouts since his return were second on the Rockies to onlyJimenez' 165...his 159.0 innings and 10 wins were also second to Jimenez...Went 4-0, 1.83 (39.1 ip, 8 er) in six starts during the month of June...the 4 wins and 1.83 ERA were byfar his best for any single month in 2010...is 9-1 with a 3.35 ERA (94.0 ip, 35 er) in 21 games/11 startsin his career during the month of June...Went 7-3, 4.08 (90.1 ip, 41 er) in 15 starts prior to the All-Star break...following the break, he went 3-6,5.56 (87.1 ip, 54 er) in 15 starts...Had a career-high 28.1-inning scoreless streak from 6/1-24...the streak was the third longest in theNational League in 2010, and the second-longest by a Rockies starting pitcher in franchise history(Jimenez 33.0 innings, 5/15-6/6/10)...the streak spanned a total of five starts (Rockies went 4-1)...Had a career-high 6-game win-streak ended with a loss 7/16 at CIN...the streak dated back to his win5/27 vs. Arizona...had three no-decisions over the stretch and had a 2.17 ERA (58.0 ip, 14 er) while walking15 and striking out 46...the Rockies went 8-1 over his winning-streak...Hammel set a career-high with 10 strikeouts 7/16 at CIN...despite getting the loss he bettered his previoushigh by two strikeouts...tied his career-high at the time (5/27 vs. ARI & 7/4 vs. SF) and set his careerhighfor strikeouts. In first season with Rockies, Hammelranked 4th on the club in innings pitched (176.2)and 3rd in strikeouts (133)...his 3.17 strikeouts perwalk ratio was the best mark on the club...issuedteam-low (among starters) 2.14 walks per 9 inningspitched...Rox won 17 of Hammel's 25 starts afterMay 24, including his career-long 5-game winningstreak from 5/24-6/26...went 7-5 with a 3.13 ERA in18 games/15 starts on the road; his road ERA wasthe 9th-lowest mark in the NL...struggled at home tobegin the season, but his Coors numbers got betteras the season went on; Rox won 10 of his final 12starts at Coors Field...a career 9-14 pitcher with a5.64 ERA against AL teams in his career, Hammelwent 3-0 in 3 Interleague starts (at DET, vs. SEA, at OAK)...on average, Hammel allowed 10.34 hits per 9 innings pitched, the 5th-highest mark in the NL(trailed Livan Hernandez, 10.78; Derek Lowe, 10.73; Braden Looper, 10.45; Mike Pelfrey, 10.40)...but helogged an opp. batting avg. of .228 (34-for-149) in Sept...allowed 58 of his 90 runs (64.4 pct.) from innings1-3 as a starter; only 32 runs scored off Hammel from innings 4 through the end of the game...the bullpenblew 4 saves behind Hammel, which would have been wins for him...Hammel also allowed the mostunearned runs on the Rox staff in '09...averaged just 88.1 pitches per start, including 15.6 pitches perinning, the 2nd-best mark by a starter on the club (Marquis-15.0 pitches per inning)...competed for theRays final rotation spot during 2009 Spring Training; went 0-1 with a 3.96 ERA (25.0 ip, 11 er) with 18 K'sin 7 games/4 starts during Grapefruit League play...was acquired from the Rays in exchange for minorleague right-handed pitcher Aneury Rodriguez on Sunday, April 5 (day before Opening Day)...made Roxdebut 4/11 vs. PHI with 2.2 ip; threw 54 pitches, 31 strikes...pitched 2.0-plus innings in each of his first 3outings with the Rox, all as a reliever (6.2 ip, 7 hits, 2 runs/earned, 2 walks, 5 strikeouts)...started in placeof LHP Franklin Morales (15-day DL; left shoulder strain) on 4/27 vs. SD; was spotted a 6-4 lead but tooka no-decision in his first Rox start...was winless in his first 5 starts (4/27-5/19), going 0-3 with a 5.11 ERA(24.2 ip, 14 er); 3 of those starts were at Coors Field, where he failed to make it out of the 6th inning inthose games...earned his first victory in a Rockies uniform by allowing just one run in 6.0 innings 5/24 atDET...took a no-decision in his next start, 5/30 vs. SD, but won his next 3 consecutive starting assignments(6/4-14); Hammel earned the first and last wins of the Rockies' club-record tying 11-game win streak fromJune 4-14...earned his 4th straight win in a rain shortened start 6/14 vs. SEA; exited as the game wasdelayed in the 6th after tossing 5.1 innings and allowing just one run with 6 K's...finished 4-0, 3.41 ERA inJune, the only NL pitcher to have at least 4 wins with no losses in that month...had a personal 5-decisionwinning streak from 5/24-6/26; during the streak, Hammel went 5-0 with a 3.92 ERA (41.1 ip, 18 er) with31 strikeouts and just 10 walks...his win streak ended the same day he tossed his first career completegame, 7/1 at LAD (8.0 ip); however, Hammel was charged with the loss in that game, as he allowed onerun in the 8th inning of a 1-0 Rockies loss...that start came a day after Jason Marquis tossed a completegame at LAD; Hammel and Jason Marquis became the first Rox teammates to toss back-to-back completegames since Jeff Francis (7/24/06 vs. STL) and Jason Jennings (7/25/06 vs. STL) did so in 2006...Hammeland Marquis needed a combined total of 189 pitches for their complete games, as Hammel threw 103 pitchesin his start while Marquis needed 86 pitches...went winless in July (6 starts), posting a 5.76 ERA (highestmark for any month in '09)...tossed his first quality start at Coors Field (9th start at home) on 7/24 vs.SF...snapped a 6-start winless streak 8/4 at Philadelphia as the Rox won their only game of the series; tiedcareer high with 8 K's in 7.1 innings 9/9 vs. CIN...took no-decision 9/24 vs. SD despite leaving in the 7thwith one out and holding a 3-1 lead...earned 10th win of the season in his last start on 9/30 vs. MIL...made4th relief appearance of season 10/4 at LAD, tossing 2.0 scoreless frames...tossed at least 6.0 innings in5 of his final 6 starts...allowed 3 earned runs or less 10 of his last 12 starts of the season. Twenty-five-year-old spent his first full seasonin the majors...opened the year as the No. 5man in the rotation and made 5 starts in April,but moved to the bullpen for the rest of theseason with Scott Kazmir's return from the DLon May 4.Made 3 consecutive quality starts from April12-23...worked a career-high 7.0 innings April12 vs. BAL, earning no decision in the 3-2 loss(5-H, 2-R/ER, 1-BB, 6-SO), arguably the beststart of his career...won 7-3 at the Metrodomeon April 17 (6.0-IP, 6-H, 3-R/ER, 2-BB, 5-SO),his first victory of the season.Nine of his 35 relief outings lasted 2.0 inningsor longer, including four 3.0-inning apps.Defeated TOR ace Roy Halladay April 23 at theDisney Sports Complex in Orlando...markedthe first time of his career he won two straightstarts, two straight apps, or two straight decisions...while he had allowed just 1-HR in 19.0-IP entering the game, all 3 runs scored on apair of home runs by Matt Stairs...totaled 6.0-IP, 4-H, 3-R/ER, 4-BB, 2-SO...Rays improvedto 4-0 all-time in games vs. TOR started byHammel...Rays went on to beat Halladay 3times on the year, joining the 2007 Red Sox asthe only teams ever to do so.Earned his first career save Sep 10 at BOS, inthe Rays longest game by innings of 2008...entered in the 14th inning with no out after TroyPercival loaded the bases, with the Rays leading4-1 after Carlos Peña's 3-run homer...was8th pitcher used by the Rays in the game...Kevin Youkilis hit a sac fly, Jason Bay struckout, and Alex Cora flew out to CF...Rays won4-2.Recorded his 2nd save on the season's finalday, Sep 28 at DET, as the Rays won 8-7 in 11innings...worked a perfect 11th with a strikeout...was the 8th Rays pitcher in the game.In the Sep 4 home win over NYY (7-5), allowed5 runs in the 9th inning, including back-tobackHR by Derek Jeter (3-run) and Alex Rodriguez...it was A-Rod's 550th career HR andhis 205th as a Yankee, passing Jeter (204) andtying Dave Winfield and Jason Giambi (205)for 10th place on the club's all-time list.Worked 2.2 of the extra frames Aug 14 in Oaklandand picked up his 4th win...also earnedthe win May 19 over OAK with 3.0 scorelessinnings. Twenty-five year-old rookie was recalled from AAA Durham on June 11 and joined the Rays rotation in July where he remained the rest of the season ... Pitched a combined 161.1 innings between the Rays and AAA ... In his 13 starts: 2-5, 6.15 ERA (67.1-IP, 79-H, 46- R/ER, 27-BB, 46-SO) pitched to a 6.11 ERA in 10 relief apps ... Led the staff with 33.0 innings pitched in September ... was 2-1 for the month in 6 starts with a 4.09 ERA (IP-33.0, H-36, ER-15, BB-9, SO-27) ... Rays were 5-2 in his last 7 starts. Was winless in his first 18 major league starts was 0-6 in 9 starts in 2006 and 0-4 in 9 starts in 2007), longest such stretch to start a career since Oakland's Mike Mohler was winless in all 20 of his career starts from 1993 to 1997 ... Beat Andy Pettitte at Yankee Stadium, 8-2, on Sep 2 (his 25th birthday) for his first win as a starter...his line: IP-5.0, H-5, R-1, ER-1, BB-0, SO- 7 ... Pettitte had won 12 straight vs. Tampa Bay and had a 13-1 career mark against the Rays ... Earned his second win as a starter on the last day of the season when he won at Toronto on Sep 30 over A.J. Burnett who had a 6-1 lifetime mark against the Rays ... Hammel's line: IP-5.0, H- 7, R-4, ER-4, BB-2, SO-6 ... was arguably his best start of the season ... yielded just a run on 5 hits and no walks over 6.0 innings while striking out 6 ... left with a 7-1 lead after 97 pitches but the bullpen couldn't hold it and Rays lost 8-7 ... In his 2nd start of the season at home vs. Boston on July 27, he retired 16 of the first 17 batters, but walked two straight batters in the 6th and was removed after 88 pitches ... Juan Salas entered the game and allowed a 3-run homer to Kevin Youkilis and the Rays lost 7-1 to Tim Wakefield ... In his first appearance after recall from Durham, he threw a career-high 6.2 innings in relief vs. San Diego and fanned 8 batters, tying the club record for most K's by a reliever also held by Jorge Sosa (Aug 17, 2003 at Cleveland) ... In his 2nd appearance he worked a 2.1 perfect innings in relief of Edwin Jackson and earned his first major league win at Arizona on June 18 ... also doubled off Livan Hernandez in his first plate appearance and drove in a run ... Was 4-5 with a 3.42 ERA in 13 starts with the Bulls ... threw 2 complete games, including a shutout, and held opponents to a .216 batting avg. ... threw a complete game shutout for Durham on May 28 winning 8-0 over Ottawa (Phillies) ... IP-9, H-5, BB-0, SO-6. Made 2 tours with the Rays...Was up in April when LHP Mark Hendrickson went on the disabled list and was 0-1 (10.80 ERA) in 2 starts...Was recalled again on Aug 23 when RHP Jae Seo was placed on the DL and went 0-5 (7.07)...Became the first Ray to begin his major league career 0-6...Three Rays had gone 0-5: Jason Standridge (2003), Dan Wheeler (1999-00) and Dewon Brazelton (2002-03)...Rays were 3-6 in his 9 starts...Had his best stretch in his first 3 starts after his recall in August...The Rays went 2-1 in those 3 games and he pitched to a 3.12 ERA (IP-17.1, ER-6)...Tossed a career-high 6.0 innings Sept 6 against Minnesota...Limited the Twins to just 3 hits and a run (a Joe Mauer solo home run)...Left trailing 1-0, but the Rays rallied for a 4-2 win snapping a club-record 14-game losing streak to the Twins...Rays also rallied in his previous start at Chicago on Aug 31 he was lifted after 5.2 innings trailing 3-2 (7-H, 3-R/ER, 3-BB, 3-SO)...Rays came back for the 5-3 win in 10 innings to snap a 6-game losing skid, just the Rays' 2nd win on the road after the All-Star Break...allowed a 6th inning, 2-run HR to AJ Pierzynski that put the Sox ahead 3-2...Opponents batted .265 (18-68) off him in the first two innings and .374 (43-115) thereafter...Was 5-9 with a 4.23 ERA in 24 starts at AAA Durham ... was leading the staff in strikeouts (117), 2nd in starts and 3rd in innings (127.2) at the time of his August promotion...With Durham, worked to a 1.29 ERA (21-IP, 3-ER) in August striking out 30 while walking just 4 leading up to recall...Was shutout 6 times at Tampa Bay (1) and Durham (5) combined...On July 16 against Columbus (Yankees) he combined with Juan Salas for the first ever no-hitter in Bulls' Triple-A history and just the 2nd ever at Durham Bulls Athletic Park...tossed 8.1 innings in the Bulls' 4-1 win...Hammel retired his first batter faced in the 9th before a hit batter and a pair of errors put runners on the corners...with Hammel at 125 pitches, Juan Salas came in and recordedthe final 2 outs...run scored on a Salas wild pitch...Fanned 13 batters (no walks) Aug 16 at Toledo (Tigers) setting a Durham Triple-A record...was one shy of his career high with Bakersfield in 2004...only Scranton's Cole Hamels struck out more batters (14) in a game in the International League this season...Rated the 14th best prospect in the International League by Baseball America...His 488 career minor league strikeouts are the 10th most K's all-time among Rays farmhands and his 3.47 career minor league ERA is 6th best all-time. The 23-year-old was named the Rays Minor League Pitcher of the Year after combining to go 11-4 with a 3.24 ERA in 22 games at Montgomery (AA) and Durham (AAA) ... His 11 victories were second most in the organization ... his 124 strikeouts also ranked second among Rays minor leaguers ... Began the year on the disabled list recovering from a broken right forearm suffered duringthe offseason ... Made his double-A debut May 11 with Montgomery upon his return from the DL ... that night in Jacksonville (LAD), he struck out a season-high 9 over 6.0 IP earning the win ... Went 8-2 with a 2.66 ERA with the Biscuits throwing quality starts in 10 of his 12 outingsincluding nine straight May 22 through July 4 ... Led the Biscuits in wins and complete games (3) and led all regular Biscuits starters in ERAand opponents average against (.235) ... Was tabbed as a Southern League midseason All-Star (did not play) ... Tossed three complete games (June 6, June 12, July 4) ... one of just three pitchers in the SL to accomplish the feat ... the CG on Independence Day was the first of the 9-inning variety in Montgomery history ... Named the organization's June minor league player of the month (5-1, 2.09 ERA, 6-GS,11-BB, 44-SO, .208 opp. avg.) ... At the time of his promotion to Durham on July 16, Hammel ranked second in the Southern League in ERA and was tied for third in wins ... Made 10 starts at Durham going 3-2 with a 4.12 ERA, fanning 48 and walking 27 in 54.2 innings of work ... In three games at Durham Bulls Athletic Park he allowed just 3 earned runs in 15.0 IP and held opponents to a .179 avg ... Ranked as the Rays' 3rd best prospect by Baseball America. Led all Rays' minor leaguers with 156 strikeouts and a 2.64 ERA combined between Charleston (A) and Bakersfield (A) in 2004 ... Was the 6th-lowest ERA and the 7th-highest strikeout total ever by a Rays minor leaguer ... Named Bakersfield Pitcher of the Year ... Was 6-2 giving up just 15 earned runs in 72.1 innings pitched (1.87 ERA) over 11 starts withthe Blaze holding opponents to a mere .208 average ... Allowed just 1 ER and fanned 43 over his final 5 starts of the year (4-0, 36.2 IP) ... Fanned 14 of the 24 batters he faced on Aug. 26 against Visalia (Rockies), the most in asingle game that season in the organization and the most by a Rays minor leaguer sinceChris Flinn struck out 14 on July 12, 2002 ... Only Alex Santos (15) and Joe Kennedy (17)have more K's in a single game in Rays minor league history ... Went 3-1 with a 1.80 ERA in August (20-H, 9-R, 7-ER, 13-BB, 37-K, .171 opp. avg.) earning Rays' player of the month honors ... Began the year with Charleston where he was 4-7 with a 3.23 ERA (94.2-IP, 34-ER)...Led theRiverDogs with 88 strikeouts at the time of his promotion ... Had 20 unearned runs with the 'Dogs, tied for most in the SAL (3 others) ... His 23 combined unearned runs were tied for most among all minor leaguers (3 others) (source: HoweSportsdata) ... Compiled a stretch of 8 consecutive starts Apr 18 - May 27 in which he allowed 1 ER or less lowering his ERA from 11.05 to 2.79 ... Named by Baseball America as the 4th-best prospect in the organization and included in the Baseball America top 20 Cal-League prospects as well as being tabbed by the publication as having the best curveball in the organization. Spent 2003 with Single-A Charleston before his season was cut short with a broken wrist onJuly 24 ... Made 4 starts (3-0, 1.92 ERA) when he landed on the disabled list Apr. 30 with a right elbow strain ... Returned May 15...Was 3-2 over his next 8 starts with a 3.86 ERA (IP-49.0, ER-21) when his season ended due to a fractured scaphoid bone in his right wrist ... Was credited with his first career complete game July 2 in a 7.0-inning contest with South Georgia (Dodgers) ... His line: 7.0ip, 4h, 2r, 1er, 2bb, 6so ... Allowed 2 home runs June 13 at Ashville (Rockies) ... Were the first HR allowed by Hammel in his professional career, he had thrown 97.1 innings without allowing a homer. Split time with Princeton (R) and Hudson Valley (A) in 2002 in his first professional season ... Began the year with the P-Rays where he appeared in 2 games throwing 5.1 shutout inningsof relief (5-K, 0-BB) ... Made 13 appearances with Hudson Valley including 10 starts (1-5, 5.23 ERA, 14 BB, 38 SO). 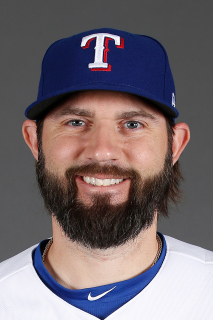 March 24, 2019 Texas Rangers released RHP Jason Hammel. February 1, 2019 Texas Rangers signed free agent RHP Jason Hammel to a minor league contract and invited him to spring training. October 31, 2018 RHP Jason Hammel elected free agency. February 8, 2017 Kansas City Royals signed free agent RHP Jason Hammel. November 6, 2016 RHP Jason Hammel elected free agency. November 3, 2016 Chicago Cubs activated RHP Jason Hammel. October 7, 2016 Chicago Cubs reassigned RHP Jason Hammel to the minor leagues. August 9, 2016 Chicago Cubs activated RHP Jason Hammel from the bereavement list. August 3, 2016 Chicago Cubs placed RHP Jason Hammel on the bereavement list. October 9, 2015 Chicago Cubs activated RHP Jason Hammel. October 7, 2015 Chicago Cubs reassigned RHP Jason Hammel to the minor leagues. December 12, 2014 Chicago Cubs signed free agent RHP Jason Hammel. October 30, 2014 RHP Jason Hammel elected free agency. July 7, 2014 Oakland Athletics activated RHP Jason Hammel. February 13, 2014 Chicago Cubs signed free agent RHP Jason Hammel. September 5, 2013 Baltimore Orioles activated RHP Jason Hammel from the 15-day disabled list. September 3, 2013 Baltimore Orioles sent RHP Jason Hammel on a rehab assignment to Aberdeen IronBirds. August 29, 2013 Baltimore Orioles sent RHP Jason Hammel on a rehab assignment to Bowie Baysox. July 31, 2013 Baltimore Orioles placed RHP Jason Hammel on the 15-day disabled list retroactive to July 29, 2013. Right flexor mass strain. October 7, 2012 Baltimore Orioles activated RHP Jason Hammel. September 6, 2012 Baltimore Orioles activated RHP Jason Hammel from the 15-day disabled list. September 1, 2012 sent RHP Jason Hammel on a rehab assignment to Frederick Keys. July 15, 2012 Baltimore Orioles placed RHP Jason Hammel on the 15-day disabled list retroactive to July 14, 2012. Right knee injury. February 6, 2012 Baltimore Orioles traded RHP Jeremy Guthrie to Colorado Rockies for RHP Jason Hammel and RHP Matt Lindstrom. September 6, 2011 Jason Hammel assigned to Colorado Rockies. May 15, 2010 Jason Hammel roster status changed by Colorado Rockies. May 7, 2010 sent RHP Jason Hammel on a rehab assignment to Colorado Springs Sky Sox. April 27, 2010 Colorado Rockies placed RHP Jason Hammel on the 15-day disabled list. Strained right groin. April 8, 2009 Colorado Rockies recalled RHP Jason Hammel from Colorado Springs Sky Sox. April 6, 2009 Colorado Rockies optioned Jason Hammel to Colorado Springs Sky Sox.